This bread really is out of this world delicious. You MUST try it once! Begin by proofing the yeast. Combine the yeast, water, and sugar and mix. Set aside about 8 minutes until the yeast is activated. It is ready when a puffy cloud forms over the water. Your yeast is good and ready! Combine the flour with the salt in the bowl of a tabletop mixer and mix the ingredients to combine. Add the yeast mixture and the olive oil. With the dough hook attachment, knead on low speed for 7-8 minutes. This can also be done in a large bowl by hand. The kneading time will increase to 10-12 minutes or until the dough is soft and smooth. Place the dough in an oiled bowl covered with a kitchen towel or with plastic wrap. Set aside to rise until doubled in size. This takes about 45 minutes to 1 hour. It may take longer if it is cold in your home. Tip: If you have a cast iron pan and a pizza stone place the cast iron pan on the lowest rack of your oven and the pizza stone in the middle rack. Place them in the oven while the oven is cold so that the pizza stone does not crack. Let them warm while the oven is preheating. 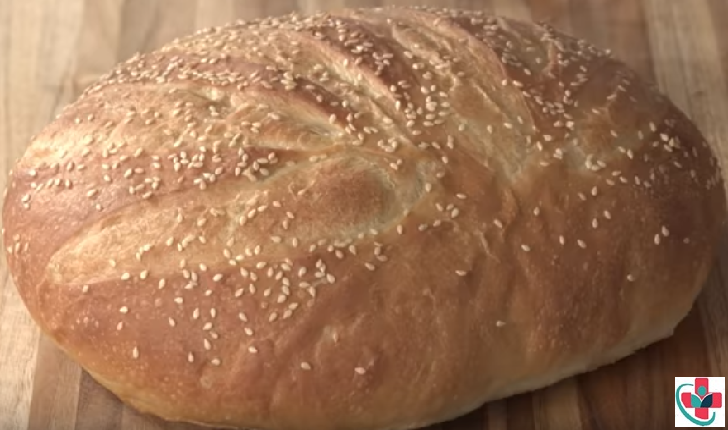 Doing this will help you create bakery style bread rings. Crusty on the outside and soft on the inside. Punch the dough down and form into a ball. You may also form it into a baguette. I prefer the round shape. Place the formed dough onto a half sheet pan lined with parchment paper and cover with a clean towel. Set aside to rise about 30 minutes. It will almost double in size. Brush the top of the dough with water. Make 4 decorative slices on top and sprinkle with sesame seeds if desired. To create a nice crusty top, pour 1 cup of ice water in the cast iron pan to create steam. Place the baking tray with the dough on it on the middle oven rack. Reduce the oven temperature to 450°F (232°C). Let it bake for 30 minutes. Remove the bread from the pan and place directly onto the pizza stone and bake 5 more minutes. This will make the bread have an extra crispy crust. Allow the bread to rest at room temperature at least 30 minutes before slicing. This will allow the steam to distribute throughout the bread and create a very moist interior. Warm the bread in the oven for 5 minutes before slicing.